This silly little book is a read-aloud gem. A donkey declares on the cover “I yam a donkey!” But unfortunately, he’s speaking to a yam and a rather persnickety one at that. The yam can’t leave the donkey’s odd grammar alone, and tries to correct him, but that quickly devolves into a “Who’s on first” type of exchange where misunderstandings pile up and the silliness does too. When the yam finally manages to explain that he is not a donkey (as the donkey has been misunderstanding) but actually a yam and all of the other characters are also vegetables, the ending takes a deliciously dark turn. Bell uses impeccable comedic timing to make this picture book work so well. The vaudeville like comedy works perfectly here, playing up the stodgy yam and the enthusiastically confused donkey. The two are divergent personalities and make for a book that is such a strong read aloud that you really can’t read it silently. It begs to be shared and done with exquisitely different and wild voices since it’s written entirely in dialogue. Bell’s illustrations are large and funny. Again, the two characters are shown as very different and the donkey mistaken the rather wrinkly and orange yam as a donkey is made all the funnier thanks to the illustrations. The final twist is wonderful and will have children who are a little older than preschool enjoying the grammar jokes and the ending together. Funny, wildly silly and completely satisfying, this picture book will work best with elementary aged children who will get the dark humor as well as the grammar jokes. Appropriate for ages 5-8. All different sorts of vegetables demonstrate the joys of wearing big-kid underwear in all sorts of colors and styles. Never taking the subject too seriously, this book celebrates an often under-appreciated piece of clothing. One after another vegetables show the different sorts of underwear from dirty to clean, big to small, and serious to funny. But there is one sort of kid who doesn’t wear underwear, since babies wear diapers. Suitable giggle-worthy, these grinning vegetables invite young children to join the underwear ranks. Chapman has written this book in an infectious rhyme that is jaunty and adds much to the fun of reading this book aloud. One never quite knows what is on the next page, except that it will be friendly and fun. The book ends with a silly reminder that you should have your clothes on top of your underwear before you leave the house, something that will have preschoolers laughing along. Chapmas has created an entire garden of smiling vegetables here. Using whitespace very nicely, they pop on the page in all of their colorfulness. The vegetables are friendly, approachable and entirely silly. Children will immediately get the joke of vegetables being the ones to show humans how to wear undies. Funny and friendly, this is a great pick for potty training giggles. Appropriate for ages 3-5. Get into the summer veggie crunching mood with this book that celebrates vegetables of all sorts! Rah, rah, radishes! Red and white. Carrots are calling. Take a bite. Oh boy, bok choy! Brussels sprout. Broccoli. Cauliflower. Shout it out! With a rhythm that is great fun and contagious, this book will have even the most dubious children cheering for vegetables too. Sayre pairs her rhymes with bright photographs of vegetables from farmer’s markets. The freshness is apparent as is the abundance. It’s an ideal setting for celebrating farming and food. Her photographs are as crisp as the pea pods and as colorful as the peppers. A great introduction to trying new foods or visiting a farmer’s market, this book is a celebration of good eats. Yum! Appropriate for ages 2-4. Pig lives on an apple farm where they grow lots and lots of apples. And what does Pig get to eat? Apples, apples, and more apples. Mrs. Pippins owns the farm and she makes all sorts of apple dishes for pig to eat, but he is sick of apples all the time. What he really wants to eat are vegetables! So Pig breaks into the vegetable patch and begins gulping down squash, seeds and all. When Mrs. Pippin finds him in the garden, she is not happy. She ties Pig up. When she catches him trying to break the rope, she shuts him in his pen. Though Pig tries to escape, he can’t. But he is determined not to eat any more apples! Pig notices the next day that his pen looks a lot like a garden. And after digesting the squash, he has the seeds he needs to make one. Thurman’s words are simple and have a jaunty rhythm to them. There are wonderful sounds woven into the book that children will enjoy mimicking. Pig’s determination and tenacity as well as his creative solution to the problem add to the appeal. Ward’s collage and cut paper illustrations have a warmth to them. This is accentuated by the use of fabrics that offer a texture to the images. In the apple orchard, there are words on the paper that make up the leaves: apple recipes. The illustrations are large enough to read to a group. And goodness knows, the poop event at the end will be a hit! A friendly and warm introduction to gardening in an organic way, this book is a happy addition to gardening story times. Appropriate for ages 3-5. Reviewed from copy received from Kane Miller. A visually interesting book all about seeds, sprouts and the harvest. Each page is dedicated to one kind of seed complete with photographs of the seeds. That then unfolds to show a large photograph of the seedling in a cutaway format that shows below the ground to the roots and up above the ground for the leaves. Readers then unfold the page one more time to see a photograph of a child holding the fruit or vegetable. The text is very simple and rhyming. The illustrations are the heart of this book. It is a book guaranteed to fascinate children not only with the unfolding pages but with the details of the seeds and seedlings. The book covers tomatoes, blueberries, bell peppers, peas and oranges. The brief rhymes do give a sense of the needs of plants from loose dirt to warmth to water and sunshine. 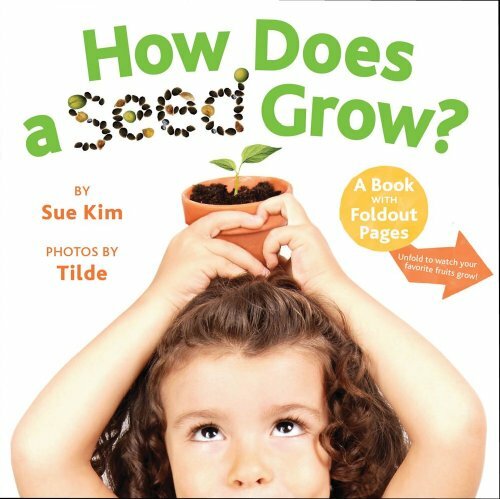 Readers will enjoy looking at the differences in the shapes and sizes of the seeds and the different ways that the seeds grow. The children pictured with the fruits and vegetables are multicultural. One quibble is that some of the pictures are a little blurred, which is noticeable when compared with the crispness of the other images. This book will work well in a classroom setting or in a story time focused on spring and plants. The foldout pages will not survive circulation at a library for long unless they are reinforced with tape. Appropriate for ages 2-5.